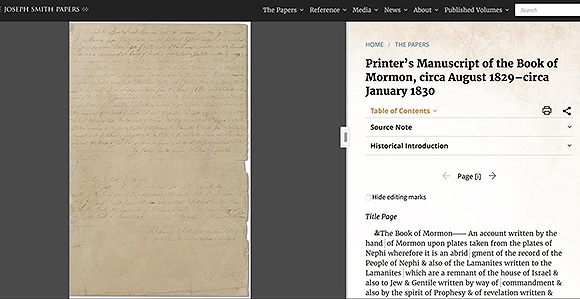 The Book of Mormon printer’s manuscript is now available to see online. The Joseph Smith Papers website at JosephSmithPapers.org shows a side-by-side comparison of the pages. You can zoom in and see the actual manuscript word for word. The printer’s manuscript is the earliest surviving copy of about 72% of the Book of Mormon text. It was recently purchased by the Church from the Community of Christ. The purchase price of $35 million was provided by generous donors. The printer’s manuscript is the copy of the Book of Mormon text made by Oliver Cowdery, Hyrum Smith, and a third, unknown scribe from the original text written by scribes as Joseph Smith dictated an English translation of the Nephite record. The printer’s manuscript was a safe copy made between April 1829 and January 1830 for use in the typesetting of the Book of Mormon in preparation for its publication in 1830. 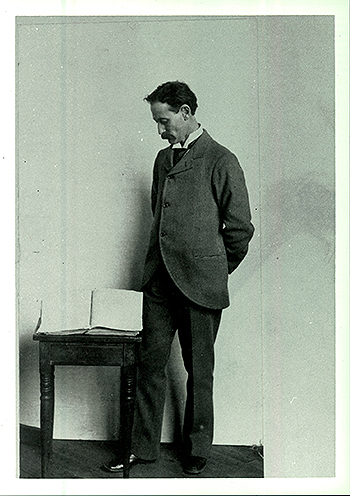 George Schweich, a grandson of early Church member David Whitmer, stands next to the printer’s manuscript of the Book of Mormon. Schweich inherited the manuscript from his grandfather and sold the manuscript in 1903 to the Reorganized Church of Jesus Christ of Latter Day Saints (later renamed Community of Christ). The Church of Jesus Christ of Latter-day Saints purchased the manuscript on September 18, 2017. After the book’s publication, the manuscript remained in the possession of Oliver Cowdery, who gave it to his brother-in-law, fellow Book of Mormon witness David Whtimer, shortly before Cowdery’s death in 1850. Whitmer’s grandson, George Schweich, sold it to the Community of Christ (then called the Reorganized Church of Jesus Christ of Latter Day Saints) in 1903. It remained in the Community of Christ archives in Independence, Missouri, until this year.